Jerry Dipoto has wanted to trade for Shed Long for quite some time. This offseason, he finally did -- and early impressions are affirming: "Shed Long can really hit." PEORIA, Ariz. — The “official” stats of spring training say otherwise, but Shed Long recorded two stinging doubles against the Oakland A’s in the Cactus League opener Feb. 21. The A’s attempted to play that day, when even the worst weather forecaster could’ve predicted the outcome: a canceled game after 1½ innings and discarded results. But even if the stats don’t show it, Long’s two plate appearances did happen against the A’s on that rainy, miserable day at Hohokam Stadium in Mesa, Ariz. The Mariners coaching staff, which is important in Long’s progression toward reaching the big leagues, still remembers — two doubles, which led to a run and an RBI. Officially, Long is now hitting .300 (3 for 10) with a .462 on-base percentage, a homer, two walks, a hit by pitch and four RBI, a stolen base. A RBI single in two at-bats Thursday raised his average. But if you add the stats from the canceled game, he’s got a .416 batting average, two doubles, a homer and five RBI with an on-base percentage over .500. The small sample size of numbers are fun to manipulate. 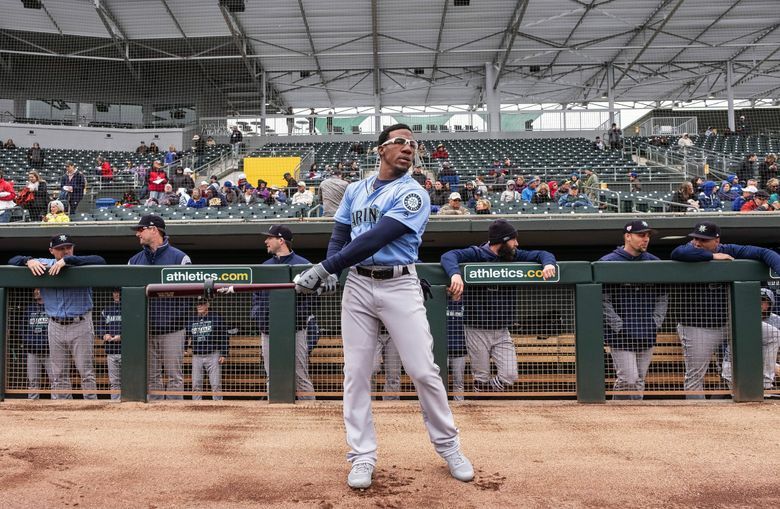 But it’s been Long’s approach at the plate and the quality of his at-bats that have caught the eye of manager Scott Servais this spring and verified general manager Jerry Dipoto’s offseason decision to trade for Long. Seattle acquired Long from the Reds/Yankees in a three-way trade. Seattle sent outfielder Josh Stowers to New York to complete the deal. The deal culminated a yearlong quest for Dipoto, who had tried on multiple occasions to acquire Long from the Reds since last offseason. Long was somewhat surprised he’d been traded. He considered himself part of the Reds’ future, but he also wasn’t aware of Dipoto’s infatuation with him. That impression came quickly when he started ripping balls all over the park during early batting practice. While he’s generously listed at 5 feet 8 inches, he’s probably a little shorter than that. Standing in batting practice groups with Kyle Lewis and Evan White, he looks diminutive. But don’t assume he’s a soft-swinging singles hitter like Chone Figgins or David Eckstein and other players of similar height. His smaller frame has plenty of muscle and hidden power, which is generated through a violent, compact swing that elicits high exit velocity off the bat. “He doesn’t get cheated on his swing,” said one opposing scout. Servais invoked a familiar name in shedding stereotypes for players based on size and appearance. Long has never limited himself to be a certain kind of hitter. He believes in hitting the ball as hard as he can. He learned to hit from his father, also named Shed. When Long is scuffling at the plate, he checks with his dad. Long is part of the Mariners’ offseason plan that Dipoto has often called a “step back.” As part of the process, the Mariners began a reshaping of the organization with an emphasis on the 2021 and 2022 season. They wanted to find players in their early 20s who were either big-league ready or on the cusp in hopes that they will come together and flourish at the same time. Long is 23. He joins Mallex Smith (25), Justus Sheffield (22), Evan White (turns 23 on April 26), Kyle Lewis (23), Jake Fraley (23), Justin Dunn (23) and Erik Swanson (25) as part of that group. Having spent all of last season at Class AA Pensacola, Long will start at Class AAA Tacoma this season. He’s the logical replacement for Dee Gordon at second base. That timetable is contingent on whether the Mariners trade Gordon before his contract expires after the 2020 season. But the organization has decided to have Long play multiple positions, which could speed up his arrival to the big leagues. If Long can play third base, the corner outfield spots and even fill in at shortstop for a game, he could find a spot on the 25-man roster much sooner because his offense is so intriguing. Long has played left field in the late innings of a couple of games this spring as well games at third base and second base. He didn’t seem concerned about the time in the outfield. Long isn’t afraid of trying different positions. As a kid, he played them all and then settled on catcher because he was on one of the few kids on his team who didn’t flinch when hitter swung at a pitch. He was drafted as a catcher out of Jacksonville High School in Jacksonville, Ala. He is quick to point out it isn’t in Jacksonville, Fla. The Reds decided he was too athletic and might not survive the pounding of playing catcher. So they converted him to second base. He had a Hall of Famer for a private tutor. That relationship continues to this day. Long trains with Larkin in the offseason. Long doesn’t like the quote necessarily, but understand what plays. If playing multiple positions will get Long to the big leagues, then he’ll happily do it. The Mariners can also see that light.